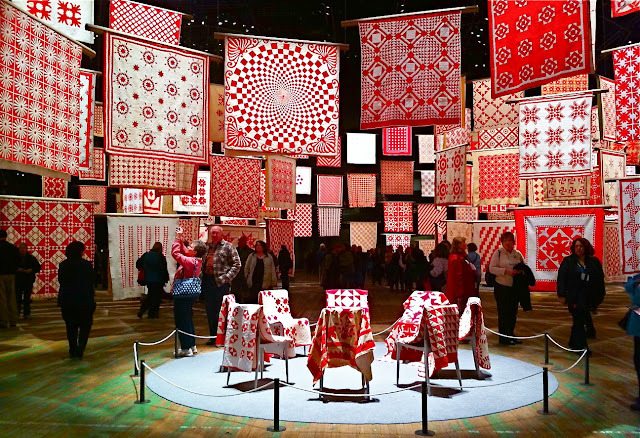 The American Folk Art Museum is presenting a special satellite exhibition of 650 quilts called "Infinite Variety: Three Centuries of Red and White Quilts" that opened yesterday at the Park Avenue Armory. The historic 55,000-square-foot Wade Thompson Drill Hall of the armory houses the dramatic installation of red and white American quilts, all of which are on loan from the collection of Joanna S. Rose. It is the largest exhibition of quilts ever held in the city. This event is free to the public, and will run through Wednesday, March 30. A café and a book and gift shop will be open during show hours (11 AM - 5 PM on March 27 and March 30; 11 AM - 7 PM on March 28 and 29). The Park Avenue Armory is located at 643 Park Avenue between 66th and 67th Streets. I read about this exhibit in a NY Times news app and thought, "Gee, what a nice if maybe over the top birthday gift to a woman who's acquired a bunch of quilts." Looking at your marvelous blog photos, however, I am stunned. What an amazing display of one absolutely incredible collection! be able to see it in person.